Today’s post is the final part of my 3 ways to wear a floral dress series (see part 1 here and part 2 here), and I’m not sure but I think I may have saved the best for last. I was positive that my first look was going to be my favourite, but now I’m not so sure. 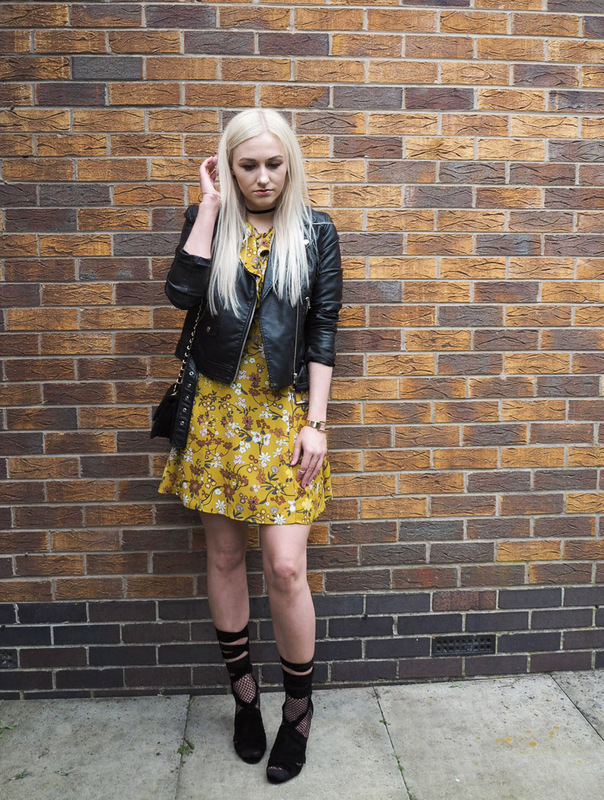 I wanted my final outfit to be an evening look and to show an edgier way to style a floral dress such as this one from Topshop. I don’t typically feature that many evening looks, so maybe that’s why I’m loving this one so darn much. My go to piece when I want to toughen my look up a bit is definitely a classic leather jacket, and a biker style is my favourite. I really love the contrast that comes from mixing a typically pretty, feminine floral dress with edgier, darker pieces such as this jacket, and I kept the rest of the look in keeping with this styling choice. These black, open toed, lace up stiletto heels from Ego are perfect to take this look into the night time, and as I’m sure I’ve mentioned before I have a deep love and real weakness for lace up shoes of any kind. I was actually lucky enough to win the shoes last week from a competition I recently entered, and I was so excited. I think it’s pretty well known that I love shoes, so winning this gorgeous pair was amazing and I couldn’t wait to feature them on the blog. As soon as I decided to do this series of posts, I knew I was going to wear them with my evening look. I can seriously hardly walk in them, but I have a steely determination that I will master them without breaking my neck in the process. As much as I love shoes, and all of the beautiful, beautiful styles that bring me so much happiness, I actually really hate my feet, and actually feet in general for that matter. So come summer time I always whip out the socks and shoes combo. It’s a look I’ve done and loved for years now and fortunately for me it’s now a popular option. Fishnet socks seem to be the go to choice at the moment and a big trend right now. I managed to find this great pair from Lamoda for just 99p, and they were the perfect pair for this outfit to add that extra bit of edge. It would have been easy to add some statement jewellery to finish this look off and glam it up, but I still wanted the focus to primarily be on the floral dress and the lovely colours which stand out against the black. So I instead decided to keep my jewellery quite subtle with a simple black velvet choker and a couple of gold bangles, and added a small black bag to complete my outfit. 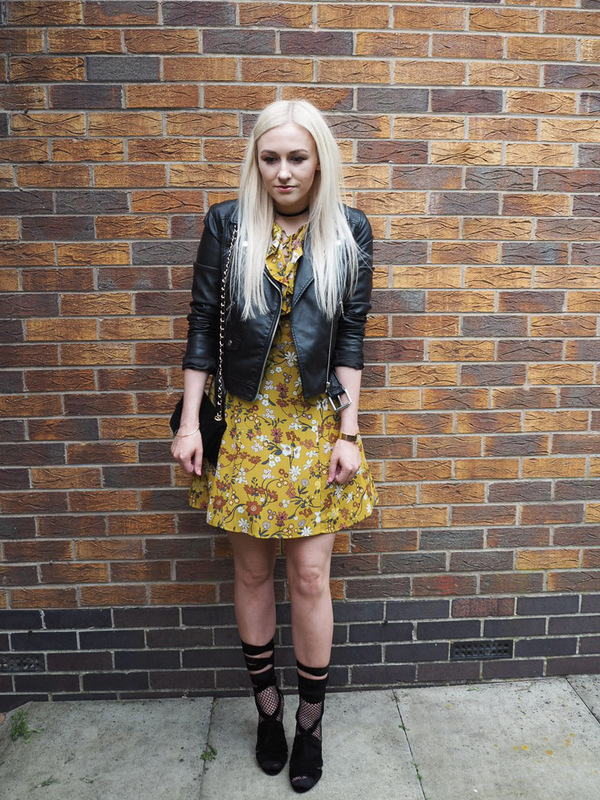 As I said in the first part of this series, there are so many ways to style a floral dress. I think they can be such a versatile piece to have in your wardrobe for the summer, and these are just 3 of my favourite ways to wear them. I’ve really enjoyed doing this little series, so I hope that you’ve enjoyed it too. I’d love to know which look has been your favourite, and let me know how you like to wear floral summer dresses. LOVE this one, you have saved the best for last for sure :D It;s perfect for a night out. You look beautiful! I am loving this look! Actually, I think this is my favourite out of the three (even though I'm in love with all three, its hard to choose). I love your leather jacket especially with the shoes! They work so well together, and the dress breaks the whole outfit up with a pop of colour. Well done on your three part series, I loved it and would love to see you do another one time soon. 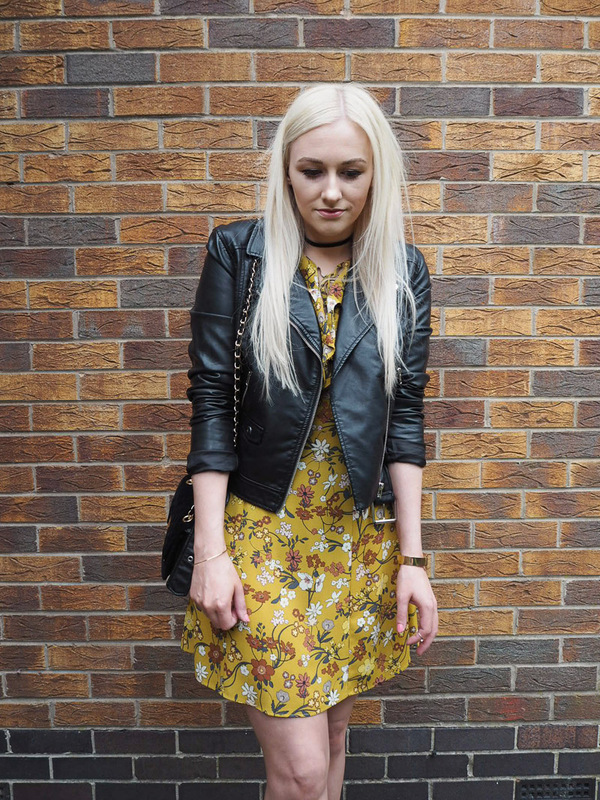 This is most definitely my favourite of the three floral dress looks you shared! Edgy yet chic and feminine, I love this style on you! You combined the dress perfectly three times, and this one is just such a good balanced out look! Love the addition of the fishnet socks - so original and a real bargain for only a pound! You're such a stunner Katie, thank you for sharing this great look! I love this edgy look! Such a great balance between tough and feminine. Oh, I love this combo. The biker jacket defiantly added an edgy feel to the dress. Hope you are doing great & having a relaxing Friday night! I love love love your shoes! Sometimes I find it hard to find summery black shoes but these are fab - not sure I would have the guts to put them with the socks but they look fab on you! Great look love! Love the combo with the leather jacket! I absolutely love this look! 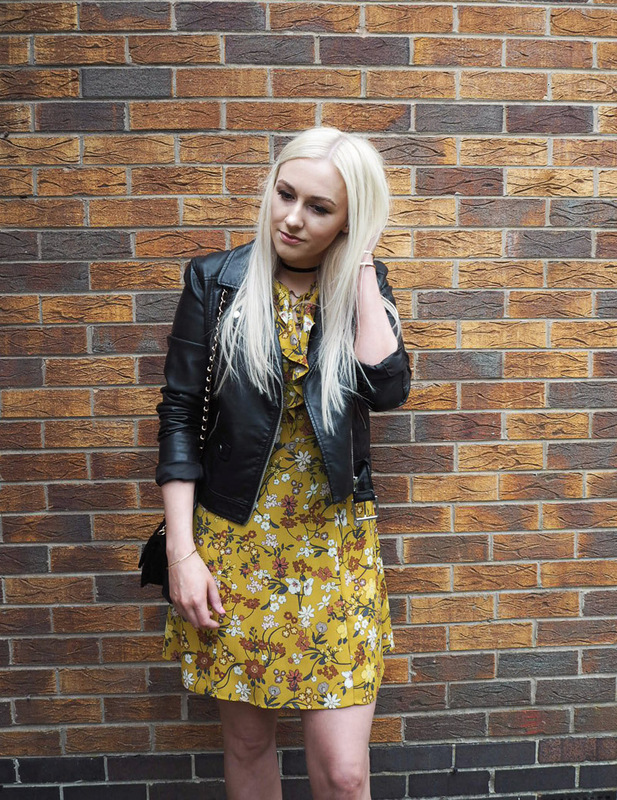 Florals and leather jackets are always such a cool combo. And those heels are stunning!